It applies to everything in life, your job, your relationships, raising your children and dealing with a major illness. I was diagnosed with throat cancer in December of 2009. I underwent a brutal treatment program beginning February 23 and completed on April 15, 2010. The primary tumour was on the base of my tongue and the cancer had spread to a lymph node. It was stage 4 but the oncologist said it was behaving like a stage 2. She said they would attack it with everything they had. She said they would make me very sick in order to get better again and they did. 35 radiation treatments and 3 of the most toxic chemotherapy cocktails they were mixing at the time. So toxic, that I had to be hospitalized in an isolation room to receive it. I lost 30 – 35 pounds. I was unable to eat solid food for about 5 months. A high calorie liquid shake put together by my wife Terrie, kept me going. As the radiation burned me from the inside, the chemo made me so nauseated that I could barely keep anything down. My throat was so sore that not even morphine killed the pain of swallowing. I was cold all the time and sick. Boy was I sick, and tired. I was asleep more than awake. The worst of it was in the 3 - 4 weeks after the final treatment. The mucous being produced was choking. I didn’t think it would ever end. And then slowly, the change began. It got a little better as each day passed. Soon the days became weeks and the weeks became months. I had constant contact with two old friends. Lyle Bauer won 3 Grey Cups over a ten year career in the CFL, all of it with the Winnipeg Blue Bombers. 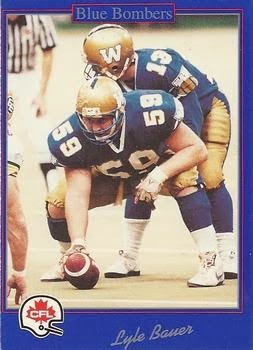 He was a center, chosen Winnipeg’s Offensive Lineman of the Year in 1988 and inducted into the Blue Bombers Hall of Fame in 1998. He went on to hold executive positions with the Blue Bombers and the CalgaryStampeders. Bauer was a warrior on the football field and he fought throat cancer with the same attitude. He has since formed the Never Alone Foundation, to raise money for cancer research. The Foundation is based in Winnipeg. The other old friend was Mac Tyler, a retired lawyer. Mac was also a gifted athlete. He had played university basketball for the UBC Thunderbirds and had a long career as one of the best crease men in box lacrosse. 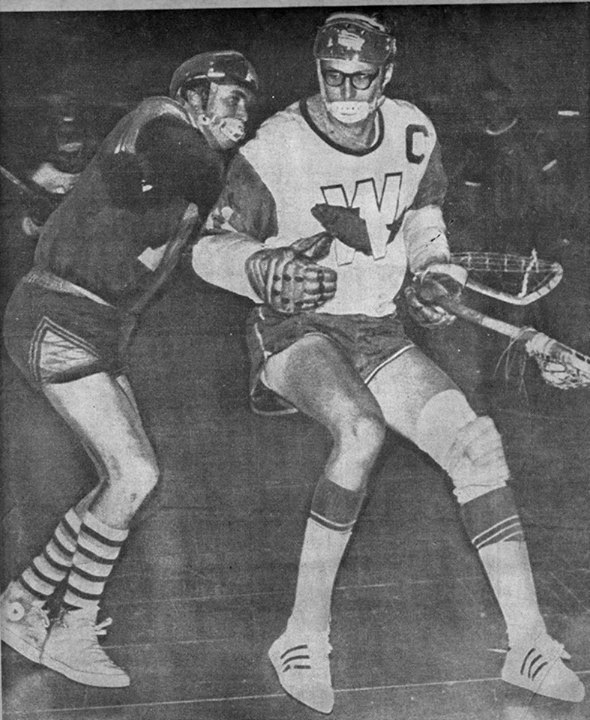 Mac retired as a member of the legendary New Westminster Salmonbellies, one of the oldest, continuous teams in Canadian sports history. Key traits of a great lacrosse player are toughness, perseverance and a keen sense of the now. The actions and reactions during the heat of battle are the difference between winning and losing. Mac was a great player, inducted into the Canadian Lacrosse Hall of Fame in 2006. He also beat throat cancer. My questions were answered. They told me what to expect. They provided encouragement and the kind of support that only someone who had “been there, done that” could offer. They inspired me to find a way to do the same thing for others diagnosed with cancer. That’s when I contacted the Canadian Cancer Society. They have a program called CancerConnection. To become a volunteer with this program, you have to be at least a year past cancer treatment, be involved in a series of seminars and role play scenarios, read a small volume of materials and have a criminal background check. I was approved as a volunteer mentor in the Fall of 2011 and have been working with clients ever since. I have had the honour of speaking with people from Ontario to British Columbia, men and women, various ages and backgrounds. Their cancers included sinus, tonsil and tongue. Most had spread to a lymph node and a couple had spread to the upper lungs. Besides having cancer, they all had one thing in common. They wanted to talk with a survivor. Some didn’t have anyone else to turn to for support. Of course they had fears and worry. Stuff was happening to them that they didn’t understand. They sought suggestions on what to do for pain, nausea, food intake, hydration, burned skin, inability to sleep, weight loss, what to expect next, all things covered by a medical team but it's not the same as hearing from someone who lived it. No it doesn’t. You should report any and all changes in your body and how it feels, to your medical team as soon as possible and be honest. It helps them know what’s happening to you and what actions they can take to alleviate your problem. Write it down. Take a list with you to the next appointment. You have to. My friend Mac called it chemo-head. You are in a fog, unable to remember very much. Fighting cancer is a process, a carefully designed plan of attack involving all the medical tools available. The fix doesn’t happen overnight. Cancer is not a condition where you drink your liquids and take a couple of aspirins. Persistence is critical. That lying brain often tells you to quit because the treatments are too hard. Don't give in! The need for patience doesn’t end with the last treatment. Recovery from such a beating can take months or even years. In my case, it’s been more than 3 years to get my weight and energy back. I had to learn how to eat again. The radiation can kill your small saliva glands making it almost impossible to chew and swallow certain foods. Dry things like chicken, bread or potatoes. As a result, I process food with skim milk. I go through 4 liters every two days. To enjoy a toasted cheese bagel with peanut butter means a tall glass of milk. But it works. You learn tricks as you go or you get practical suggestions from a mentor like me. You can never minimize or trivialize the process. You have to take it one day at a time. You move from one success to another. You don't suddenly get well, just like you didn't suddenly get sick. "If You Couldn't Play Tomorrow, How Hard Would You Play Today"